Genuine animal brand hoody. Lovely fleece inside and only worn 3-4 times so in excellent condition. Smoke free home. The hoody is age 2 but the head gap is smaller than average and is more of a 1-2 fit. **ANIMAL Small Boys Used Burgundy Hoodie ** . Condition is well used but good. Across chest measurement approx' 16" Shoulder to waist approx' 20" Under Armpit to cuff approx' 15" Dispatched royal mail second class signed for £3.00 as soon as payment received. Thanks for looking! A lovely hoodie from ANIMAL in a brown/green khaki size XL. so grab a bargain. it is in great used condition. Boys light weight jumper from Animal, great for Spring/ summer. 100%cotton Size on label says medium, it fitted my son age 10-11. Length from shoulder to hem is approx 57 cm. Any further questions about the size please ask. BOYS BLACK THICK ANIMAL HOODIE. THICK COTTON HOODIE WITH PLAIN BLACK AND ANIMAL LOGO ON ARM AND CHEST ( chest embroidered arm printed ). BIG FRONT POCKET. 2-3 years. Genuine Animal hoodie. Worn but with plenty of wear left in it. ANIMAL Boys Royal blue Hooded Top size 9-10. Condition is New with tags. Dispatched with Royal Mail 2nd Class. BOYS 7-8 ANIMAL HOODY. Features : Superb Animal hoody in a green cotton with front motif 'New Generation', with a light stretch and lots of detail, front pockets and hidden coin/key velcro side pocket. Boys animal hoodie Size BM Age 12. Condition is Used. Dispatched with Royal Mail 2nd Class. ANIMAL boys hoodie. Perfect for the winter as made of thick material. Large Boys Animal Hoodie. Condition is Used. Dispatched with Royal Mail 2nd Class. Here at DJC we have for sale asmall Animal top for a boy, that is in the current season colour. This item is in excellent condition and shape with an eye catching logo on the front. Animal Boys Hoodie. Condition is Used. Dispatched with Royal Mail 1st Class. SIZE 2 YEAR OLD RRP £40. ANIMAL BOYS FLEECE LINED ZIP THROUGH HOODY NAVY BLUE. Material shell 59% Cotton/41% Polyester, Lining 100% Polyester. PIT TO PIT - 21". SHOULDER TO HEM - 24". 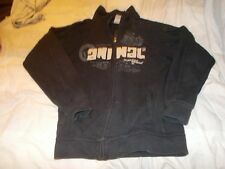 Boys ANIMAL Hoodie brown aged 7-8,xs great used condition . Condition is Used. Dispatched with Royal Mail 2nd Class. Regular Fit, Kangaroo pockets, Hooded with adjustable tie cords, Ribbed cuffs and hem, 55% Cotton 45% Polyester. Here we present a boys hoodie from Animal in very good condition, suitable for children of age 9-10 years. Pattern: Textured. Heart & Soul. Colour: Red. Size Guides. 15-16 Years. 13-14 Years. 14-15 Years. Animal Hoodie Age 5-6 Years Boys Girls Kids Children’s Jacket. Condition is Used. A little washed our but still has wear in it hence low syarting bid. Dispatched with Royal Mail Signed For® 2nd Class. Please tale a look at my other items as listing lots of children's clothes.